We have a serious thing for the Portland restaurant Teote. It’s Latin American-inspired and celebrates the arepa in all forms. I started testing arepas of my own recently, but all of my attempts fell slightly short of Teote’s glory. So I did what any sane, normal human would do: I called them and asked for their recipe. And guess what? They basically gave it to me. Well, at least their secrets. And I totally ran with them. So this, my friends, is it. 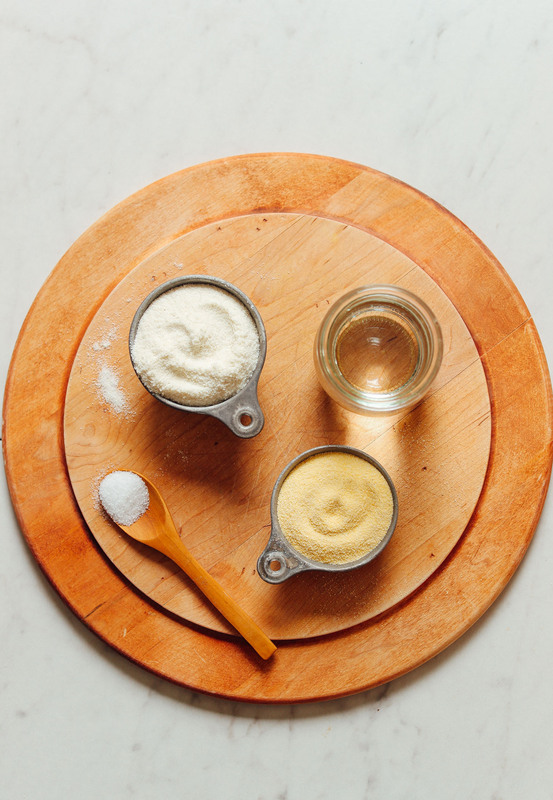 The key to unlocking perfectly flavorful, crisp-on-the-outside, tender-and-fluffy-on-the-inside arepas! Let’s do this. This recipe requires 30 minutes, 1 bowl, and just 3 ingredients: salt, water (which we don’t count as an ingredient), oil for cooking, and areparina or masarepa, which is a special pre-cooked corn flour specifically for making arepas. I know what you’re thinking: “I’ll just use cornmeal.” Not the same. Or you’re thinking, “I’ll just use masa harina.” Not the same. Trust me – I did lots of testing with many different corn flours and the results were clear: Masarepa (a.k.a areparina) is the only way to go! Plus, once you master this recipe, you’ll be making arepas all the time, so it’s a handy ingredient to have around. 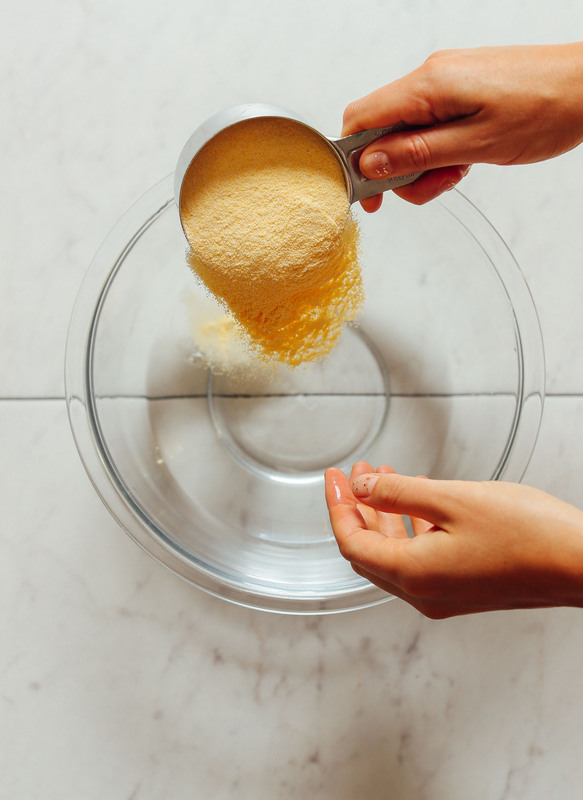 The process is simple: Dissolve salt into the water and slowly add the masarepa until a loose dough forms, stirring with a spoon or your hands. I use my hands because, when Colombian and Venezuelan grandmas use their hands, you follow suit. 1) Mixing both white and yellow masarepa (which I also recommend doing, as it creates a nice golden color but a light texture and a slightly less bitter flavor). 2) Deep frying (no wonder they taste so good). We did opt for pan frying and then baking to cook the middle all the way through, but by all means, fry away if you want! Once you get your dough where it should be, let it rest for 5 minutes. Then scoop out fist-size portions and form into a ball. If the edges crack easily or it feels too dry, add a little more water to moisten. 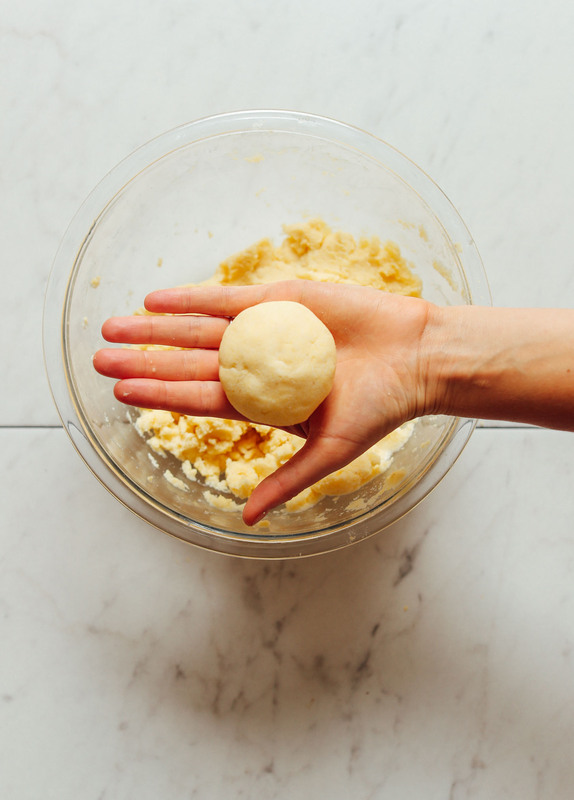 It’s a simple dough to work with. Then it’s as easy as rolling into balls and gently forming / smashing into discs. 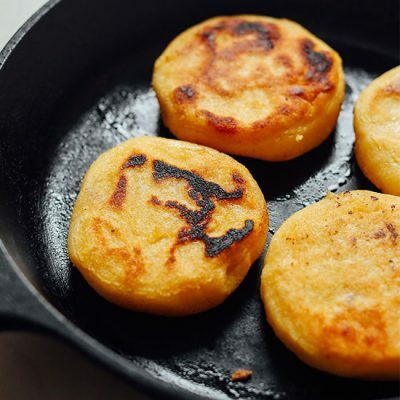 Once your arepas are formed, simply pan-fry in a little oil to form a crust (a little deep blackening is OK! ), and then finish in the oven to ensure the centers are cooked through (optional but recommended). Then enjoy! Arepas can be enjoyed plain, on the side of dishes like our Plantain Black Bean Bowl, or cut into a “pita pocket” and stuffed with just about anything, including rice, Black Beans, Vegan Barbacoa, Jackfruit Taco ‘Meat’, or Guacamole (the options are endless). You could also enjoy them with a little vegan butter and maple syrup as a special treat. Mmm. If you’re into arepas, also be sure to check out our Fluffy Cornmeal Pancakes, Perfect Vegan Cornbread, and Blackberry Cornmeal Muffins! And stay tuned, as we have an arepa sandwich coming up that’s gonna blow your minds. 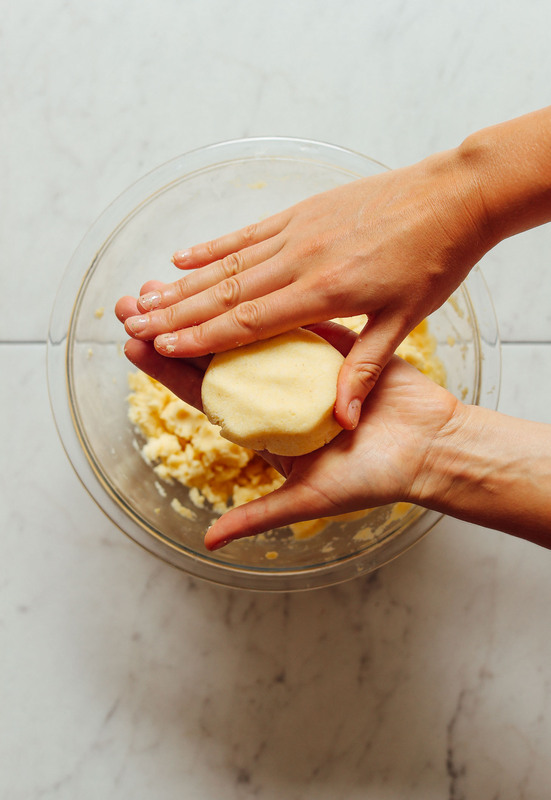 An easy, step-by-step tutorial on how to make arepas! Just 3 ingredients and simple methods required. The perfect side or base for a sandwich! A little at a time, add the areparina and stir with a whisk or your hands (our preferred method). You may work your way all the way up to two cups, although we typically have 1-2 Tbsp leftover. You’re looking for a dough that doesn’t easily stick to your hands, is moldable and moist, and can be rolled into a ball. Once you have that consistency, cover with a towel for 5 minutes. We did mix both white and yellow areparina as inspired by Teote (optional). 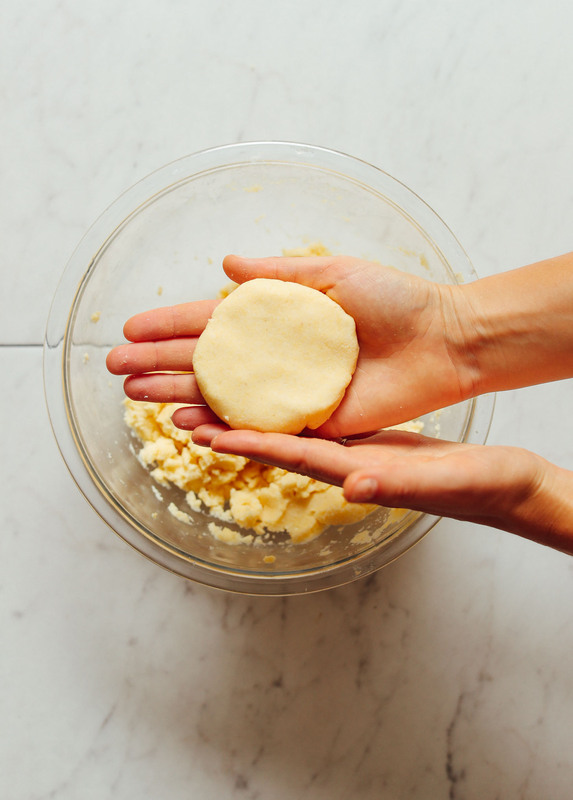 Uncover, grab a large handful of dough, and roll into a ball (as the recipe is written, our batch made 6 large arepas, but it could also make 8-10 smaller arepas). Carefully press the ball between the palms of your hands to form into a roughly 1/2-inch thick disc. 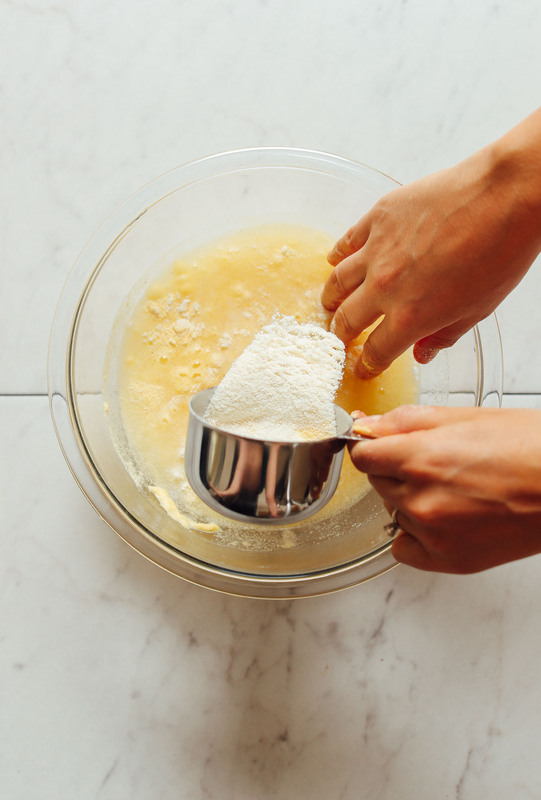 If it cracks a lot on the sides, your dough may need 1-2 (15-30 ml) more water. A little cracking is OK - just use your hands to close the cracks by gently patting along the edges (see photo). 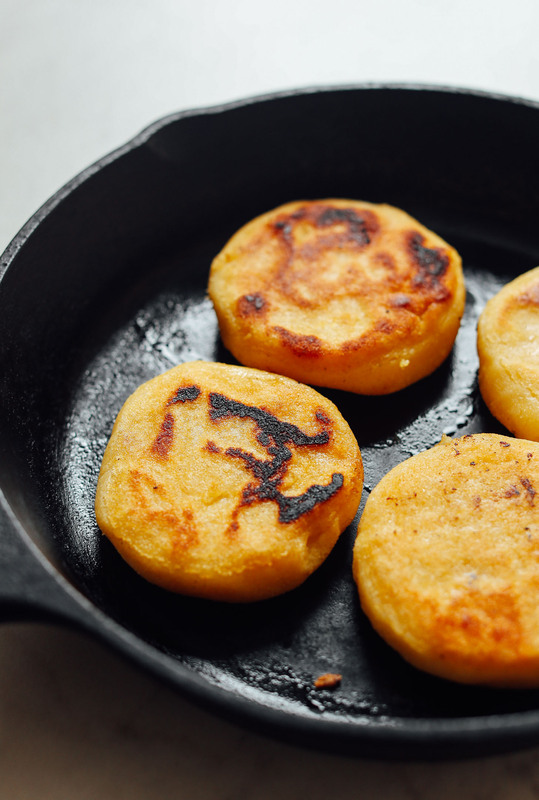 Once the arepas are formed, heat a large cast-iron or non-stick pan over medium-high heat. Once hot, add a little oil and swirl to coat. Then add arepas, giving them a little room in between so they don’t touch. Cook for 2-3 minutes or until deep golden brown (a few blackened spots are OK). You're looking to form a crust. Then flip and cook for 2-3 minutes more or until the underside is also browned. Transfer to your parchment-lined baking sheet and bake for 15-18 minutes or until slightly puffed up and a little more golden brown in color. Some people like to slice into them immediately, but I find they can be a little doughy in the middle at that stage, so I prefer to let them cool for 5-10 minutes and serve while they're warm but not piping hot. To enjoy, slice in half and enjoy as is, spread both sides with vegan butter and a little maple syrup (YUM), or cut the arepa 3/4 of the way around, leaving a seam on the edge so you can “stuff” it like a pita. Fillings could include everything from black beans to rice to guacamole or even our Vegan Barbacoa! Best when fresh. Store leftovers covered in the refrigerator up to 3-4 days or in the freezer up to 1 month (cooked or uncooked). Reheat in a 350-degree F (176 C) oven until warmed through. If reheating frozen uncooked arepas, I'd recommend letting them thaw first and cooking them as instructed. *Nutrition information is a rough estimate based on 1/6 of the recipe (as written) calculated with 1 Tbsp avocado oil for cooking. OMG, I freaking LOVE Teote! It’s always my first stop whenever I’m back in town. Trying these (finally!) tonight. Side Note: Did you watch Shrill? Last time I was at Teote, Upper Left was all blocked off with movie cameras – it was totally the last episode of Shrill! Too funny. Same! And I noticed upper left was blocked off one today (while at teote), too. But had no idea about Shrill at the time! But we have since watched it and love all the Portland sightings! Loved these! This recipe was super easy to follow and the arepas were very tasty. We made arepas benedicts. That is a brilliant idea! You have totally inspired me. Love the simplicity and the story of this recipe! It is great every time we make it – and you cannot go wrong with these three simple ingredients. Thank you! Where is the corn flour found in USA, Arizona, Yuma? Hi Harold, you can find links for shopping above. We aren’t sure where to find it in Yuma, Arizona. Have made at least 15 of your recipes by now and I have to say I was never disappointed. Tried some of your baking, milks, soups, salads, falafels and more! I have to say: you have great taste buds, such as mine (!! ), and your flavours are very accurate! Congrats!! And Thank You! (Not very common to find such great seasoning and balance in the flavours I find… Namaste!). Please continue your efforts to provide us with very tasty, quick and healthy recipes!! We need you! I tried making these with P.A.N flour and loved them but am searching for a non gmo pre-cooked corn flour. I found a company in the Canary Islands that produces it but haven’t yet found a way to buy or order it (from NewYork City). If anyone knows please share. The name of the company is: COMEZTIER the flour is: AREPAN Harina Especial Para Arepas. I made this last night. I used the PAN brand of masarepa. I followed the directions exactly for making the dough. I tried and then baked the arepas. However, once I cut them open there was still raw dough inside. I then baked them for 10-15 more minutes, but the extra baking made them really hard on the outside. Do you have any tips? Other than the arepas, the plantains, guac, beans and red cabbage give the arepas a great mix of flavor! Hello? Please advise. I have the whole bag of the PAN madarepa and would like to give arepas another try but I need some tips on how to ensure they are cooked all the way through. Thanks! Hi Maggy, they should still be slightly tender/doughy on the inside. They will also dry out more after cooking. But if you still feel like they need more cooking, you could try reducing the heat on the stovetop slightly or baking longer in the oven. Hope that helps! 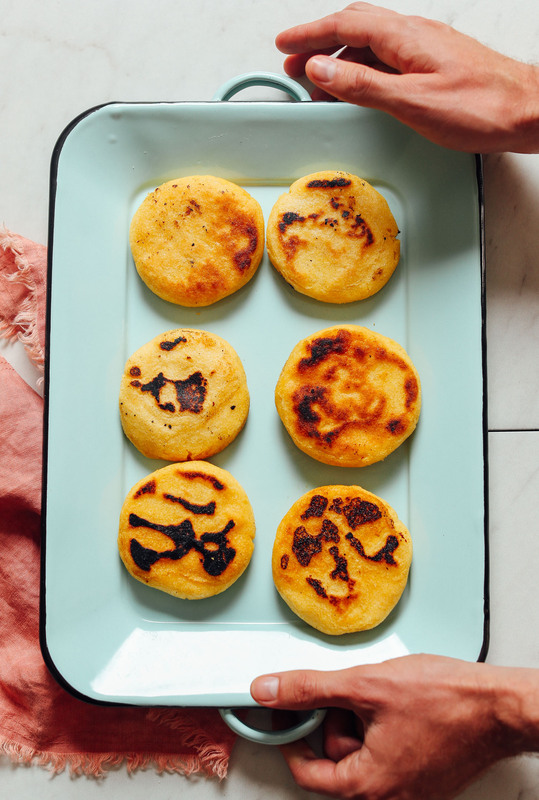 I’m excited to make arepas for the first time this weekend, so thanks for this recipe and tutorial. I’m hosting a dinner following an afternoon matinee of a play. Can I make the arepa dough in the morning before I leave, and then cook them off after we get home from the play? If so, should I pan fry them in the morning and bake them later, or do both stages of cooking afterwards? So happy with how they came out! I only had yellow Pan brand, will try again with the 2 kinds. And I ran out of time to prepare ahead before the matinee, so prepped and cooked them just before dinner. I really liked the combo of pan-frying and baking. Will definitely make again, thanks for this great recipe! Served with black beans and guasacaca and a Venezuelan beet & potato Salad. Such a great meal! Just curious where I can find masarepa, or areparina. I looked around home at the small stores but nothing. any decent substitutes? this looks too good. I am thinking that your best bet is to see if you can order it online, Marsha! Let us know if you have any luck! Yes, that may have been why! We’re glad you enjoyed them, Michaela! This made me so happy. I am Venezuelan and I eat Arepas in almost all of my breakfast. In Venezuela we call the cornflour you talk about “Harinpan” because it is the prefer brand of Venezuelans (P.A.N). 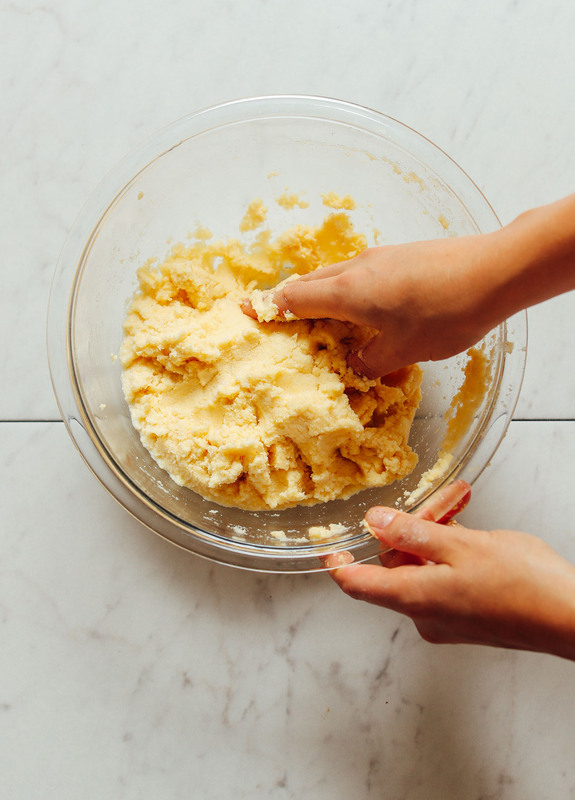 You haave to use your hands, otherwise the dough will not turn out well. For a little burst of flavor you can add some milk to the dough, it will be more creamy. Also, you can add anything to the dough for a change (carrots, oats, any veggie). a little bit hard to veganize. I came to your website today after a few coworkers sang your praises today. 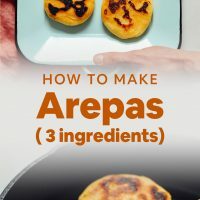 I started checking out recipes and came across this one for arepas. I visited my best friend in Portland last fall and she took me to a restaurant called Teote where I had their vegan bowl. A fun coincidence that I wanted to find a recipe because of Teote and you were inspired to make this recipe after visiting (a lot)! I like your taste and I am so excited i found you site and can’t wait to try some new recipes! Teote is my favorite!! My parents spent time in Venezuela when they were first married and my mom made arepas a few tones, but they never came out like she remembered them. I can’t wait to share this recipe with her! Can you get Teote to divulge their secrets for masas fritas next?! I can’t find one online at all but they’re just the best thing on the menu when the craving hits. After baking them, do you think they are freezable? if so how long do you think they last in the freezer? Hi Eli! Yes, you can store them in the freezer up to 1 month (cooked or uncooked). Reheat in a 350-degree F (176 C) oven until warmed through. If reheating frozen uncooked arepas, I’d recommend letting them thaw first and cooking them as instructed. If I cut them in half before freezing do you think they would work in a toaster from frozen? Or do you think the best way to reheat would be oven? I am a Venezuelan living in Canada since 2011 and make arepas a couple of days every week. It is my daughter’s favorite breakfast (born in Calgary). I feel moved that I am starting to see arepas featured in TV shows and now in your website. You honored the recipe and the emotion. Thank you for that. The fun part of eating arepas is that you can fill it (stuff it?, anyway) with literally whatever you want. Venezuela even put names to some recipes (hard to translate, they are like idioms) and order them by their name. Also, great gluten free option and can be eaten as part of any meal of the day, or night when we eat it after a big party at 3 am. and the other is instead that make it in the oven put then in a toaster twice and you will see! Hi I am Venezuelan and I am glad you guys discovered this precious treasure he have in our cuisine, The Arepas, we literally eat them almost every day for breakfast or dinner and it never gets boring because it’s versatility, and the choices for stuffing them are endless. I have to admit it takes time and a lot try-and-error to learn how to make them delicious, is not easy get the right texture and cook at the right point, that said, if your first time outcome is not great, don’t get frustrated and try again, it’s worthed! And you will have a gluten free, healthy, delicious, comfy, and cheaper substitute of bread. Some arepa tips: 1- It is better to use a cast Iron, cook at a medium temperature and make them thin for beginers to avoid unevenly cook. 2- they most be eat immediately after cooked, they are not good reheated or cold. 3- It makes a great breakfast for toddlers and babies starting eating solids, just open the warm arepa once Is cooked and dig into the dough with a spoon to leave the crust aside then you can mix that puree with anything (including tiny chopped veggies, beans, or any vegetables milk) to feed your baby with a soft, warm and savory meal. SO many good tips! Thanks for sharing, Yoxy! Hey Dana! Any ideas on where I could purchase Non-GMO masarepa? I haven’t been successful in finding yet. See some of the discussion above! Apparently some of the brands, while not organic, are non-GMO. We are so glad that you’re enjoying this recipe, Sierra! are these fluffy on the inside and if so, how can they be fluffy without using baking powder? thanks. They just puff up in the oven a little! I think the heat causes them to expand. Is there a specific brand for the white and yellow masarepa that you could recommend? Hi Gina! We mixed white and yellow from PAN and GOYA brands. Hi – what is the oven temp. and time for baking? Thanks so much! See that in step 1! I LOVE that you made arepas!!! They are hands down man’s greatest invention after the wheel (although I like arepas antioqueñas better, they are made with ground cooked dry peeled corn, and the plus, if you are making them from scratch, is that you get to enjoy “Peto” cooked corn with a sprinkle of sugar and cinnamon! Hello all! Although I haven’t made arepas, I have made a similar bread that is known in the south as hot water cornbread. Hot water cornbread uses only three ingredients as well, corn meal, salt and boiling hot water. Some add a bit of sugar, lately I’ve decided to eliminate the salt. I won’t recite the recipe here, but there are a few recipes online if you care to Google it. Just thought I would share! I made these for black bean/ plantain sandwich recipe and I am really excited about it but I had some trouble cooking the arepas all the way through. I used only the white Harina Pan. I fried then baked as described in the recipe but it took a long time for them to cook through – even ones that were thinner than yours. I know that people traditionally just cook on a skillet w a little oil for a few minutes on each side but mine definitely wern’t cooked through. Any thoughts? Did you finish them in the oven? Hi Farah, Venezuelan arepa-maker here! They shouldn’t be dry inside, they should be doughy still. They will dry out more after cooking too! Making these now… Can’t wait to try them! I have looked for an organic areparina or masarepa and can not seem to find it. Does anyone know of an organic brand? On the plus side though the corn used to make it is non GMO, and our agricultural processes are very different than the US. That’s so helpful. Thanks for sharing, Michelle! Hello! You can try making arepas with Bob’s Red Mill Organic Masa Harina Flour! I have a gluten-free business and I have used that flour so I recommend it! Thank you thank you thank you! I’m trying it today. Eventually I will use the dried corn and make from scratch but that’s not always feasible. I really appreciate this comment! I started using Bob’s Red Mill Masa Harina for arepas and pupusa’s, but I am also trying to reduce waste, so the search for an even more “green” product ensued. I just found Azure Market Organic White Corn Masa which I will try and let you all know. I was able to order a 5lb bag that is packaged in paper, not plastic…yippee! BTW, I just love the recipes on this website. It’s my go-to for all things vegan…Thank You! Thank you for this! My parents are from Barranquilla Colombia and I was born and raised in NJ. Arepas were a staple on weekends. Thanks for trying to make Arepas. Arepas are the bread for Venezuelan. We make then everyday at home for breakfast or dinner. 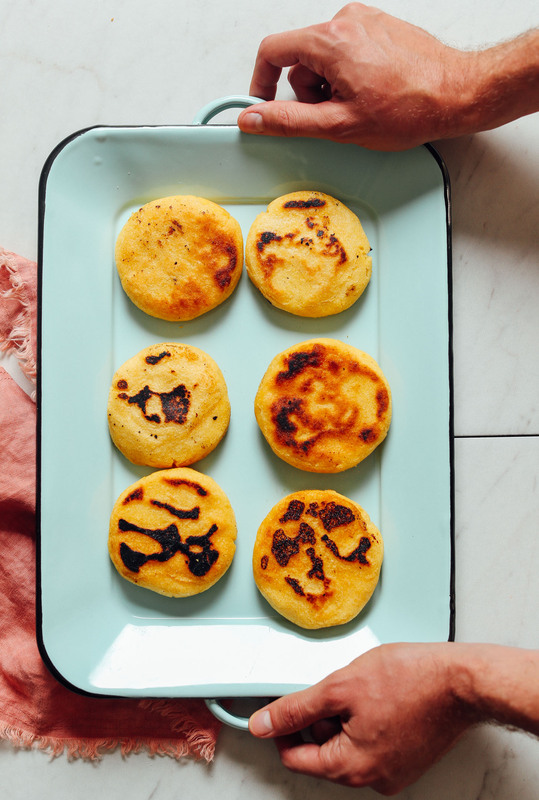 We learn how to make arepas from your mom or grandma. It is a tradition that pases through generations. As Venezuela and I would like to clarify few things. First, the flour that we used to make arepas is called “ Harina Pan” no areparina. Second, I recommend you to to kned the dough for 10 to 15 min until is soft. Add a little of warm water when you are kneding. Third, if you kned the dough well you don’t need to cover it or wait 5 min. It is ready to make the balls right away. Finally, arepas should not have a rack or oppening. It should smoth and soft. Making arepas is an art that we learn since we are kinds and it is park of our culture. Try to make again following my recomendation and let me know how it works. I am confused on the calorie count. Are you saying that it is 233 calories per piece or for 6 pieces? Never tried an arepa before, but I definitely have to now! They look like the perfect little snacks or appetizers to nibble on at a dinner party. I’d enjoy these with some guacamole or spicy salsa on top! Hi Dana, thank you for all your delicious recipes! I would love to see your take on brioche bread. Keep up the great work. -S.Y. I am dying over this! I love arepas! When my boyfriend and I visited Portland we stumbled upon Teote and loved it!!! It was his first time trying arepas too. I’ve tried making them to no avail, but I’m so excited for this recipe I’ll be trying it tomorrow! Wow! I love that you love arepas. I’m Venezuelan. You can also buy “Harina Pan” which is the most common brand for arepas. Although I try to mix it with “stone ground non gmo corn meal flour”, they still taste great and more healthy. I also add flaxseed meal to add even more fiber and add a small portion of old fashioned oats. We usually don’t measure but just to give you ideas…. you can also use the juice from freshly squeezed beets as the water in the recipe, or add grated carrots or red/green peppers to the dough. All DELICIOUS! They are so versatile. Eat them with avocado, hmmm the best! Is there a better source of masarepa? The brands you mentioned are from GMO corn? Nice you like arepas. 1st of all fried never. Not good. Colombia has more than 200 kinds of arepas and just one is fried. We grilled all of them. Zero oil. Mostly we fill them with cheese but you can add anything but never sweets. Nice you like arenas. 1st of all fried not good. Colombia has more than 200 kinds of areas and just one is fried. We grilled all of them. Zero oil. Thanks for this comment … I don’t eat fried anything. My George Forman is always ready to use. Me, too; as I was reading this recipe I am thinking that I’ll for sure make these if I can find organic (or at least non-gmo) masarepa. If anyone knows if this exists I’d love to hear! I’d like to make this! But I have a question – can you source this areparina organically? I will not support/buy/consume any product that is genetically modified. Corn is notorious for being GMO. Hmm, good question. I’m sure if you do some investigating you can find some non GMO options! Thank you for this recipe! One thing people seem to miss the most about gluten-free is no bread. I’m not vegan, but I often eat vegan since I am also egg and dairy free. It seems like every bread-like recipe has egg in it. I’ll have to order the ingredients, so won’t be able to try this until then, but so looking forward to this obvious taste treat! My cousin just got a new deep fryer so may give it a try ( though the pan/bake method sounds great too!) and was wondering time and temp in the deep fryer? Hmm, not sure! I’m guessing they don’t take long to fry. Let us know if you try! Thank you for this wonderful recipe. I’m a chef on a boat & was looking for new ideas for my vegan / gluten free guests. I fried the arepas & although I didn’t time them I went by colour (a beautiful golden brown on each side) & tapped them to hear if they sounded hollow. Took about 3-4 minutes either side on a medium heat. Delicious!!!! is Masa Harina the same thing as Masarepa? I am looking for organic and Bob’s Redmill has organic Masa Harina. No, they’re different. Masa harina is for corn tortillas, masarepa and areparina (both the same) are for making arepas. Ditto. If you find please post. No, it is different. Try Goya masa arepa, they have it white and yellow. there are a few others brands like “Harina Pam” and “La Venezolana” but I use Goya and think its the best. so sad! Sorry, Michelle! Maybe somebody could ship you some? so so kind! Thanks, Francesca! With more and more Venezuelans arriving in so many different cities, arepas are starting to come into the spotlight and it was about time. Arepas are our daily bread, all the fillings you can stuff them with, arepas are holy, deep fried arepas are next level. Next up should be Guasacaca which is a salsa made up of mainly of cilantro and parsley and sometimes avocado. Goes amazing with arepas. So kind! Thanks for the kind words and love, Julie! I feel so happy about this. Being a vegan Venezuelan, my breakfasts always used to consist of arepas filled with whatever I had lying around. This recipe is gold! I see you linked the white but where did you find the yellow Goya? Online somewhere? If not I’m in Phoenix and we have plenty of Mexican stores I’m sure it would be at. Thanks! I found them both online! Amazon. Do you know if there is a non gmo version? Thank you for highlighting Venezuelan culture! So happy to read about this, there is a similar place in San Francisco called Pica Pica. A variation on arepas are “mandocas”. You mix cooked plantain into the dough. Delicious! Wait… are mandocas made with plantain? My whole life I thought they just had panela mixed in. Mom used to make them that way too. So so so moved by this. I’m from Portland but raised in Venezuela and my father is Colombian. So, I’m familiar with both Teote and Arepas, intimately. And I’ve been following this blog for a long time so I appreciate this highlight to my cultures. When I became vegan I held onto arepas for dear life (especially when it came to breakfast) and I’m just suggesting that if you wanna turn it up a notch you should try to make a Pabellón Arepa; which is rice, beans, yellow fried plantain and shredded beef. I still haven’t found a substitute for the beef, so I’ll love for you to come up with it, maybe? Substitute for the beef? I got your back girl! Just grab the shell of the plantain, yes the shell! Boil for 5min, then shred using a fork, (be gentle!) (make sure you don’t boil for too long or it wouldn’t shred properly) And then cook as you cook the meat! Adding oil to a pan, doing a “sofrito” using veggies of your preference (I use peppers, onion, spring onion, etc) cook for few minutes then add the “shredded meat”, then I add soy sauce, tomato paste, cumin, paprika, a little bit of cayenne pepper and a little bit of salt if needed. There is a few recipes online that you can check! They are in Spanish tho… please try it! You would love it! My Flatmate is Venezuelan like me and he couldn’t believe it wasn’t meat!! that’s really interesting about the plantain use. Umm, that’s an amazing shell-of-plantain recipe. Please post it! I think people would go crazy for it! I learned how to make the plantain beef long ago, and it is delicious. At home, every Sunday its “arepa time” and I fill them with this beef, so yummy! En Venezuela, uno de los sustitutos veganos más comunes a la carne mechada ha sido la concha de plátano maduro cocida. La hierves y luego la mechas con un tenedor. Debes dejarla reposar un rato una vez esté lista porque le cuesta agarrar sabor, pero queda muy rica. But I think that carrot shredded on a spiralizer ir similar could work, too. Increible! Jamas habia escuchado eso. Gracias! Lovely personal story! I had an arepa with black beans, fried plantains, avocado and a vegan cilantro sauce. It was absolutely delectable and I did not miss the meat or cheese one bit, likely because the healthy fat of the avocado and the depth of flavour from the beans and cilantro sauce hit that same spot. The sweetness of the plantains also added to that comfort feeling. Ultimately it’s all about making sure you have all 5 tastes (sweet, salty, bitter, sour and umami) and that you are eating a combo of healthy fat, fibre, protein and greens! Then you won’t miss anything in a dish. Oh my gosh there is a food truck in Denver called Arepas House that makes that exact arepa! It’s one of my favorite dishes in Denver. I get it every time I see the truck! One of the best “shredded” beef like substitutes is green jackfruit. Maybe you can try to sub the shredded beef for jackfruit. You can season it using the bbq jackfruit recipe on this site and omit the bbq sauce and add a touch of water so that the the seasonings can marinate….idk just a suggestion. Have you tried marinating tofu in any kind of sauce? I use chili powder, cumin, turmeric, garlic, black pepper (all powder) in Bragg Liquid Aminos and a splash of Apple Cider Vinegar and a few drops of Liquid Smoke. Freeze the extra firm tofu, then thaw. Squeeze as much water out as you can. Cut it into slabs, strips, cubes, or just crumble it and put it in the marinade. Leave for a couple of hours at least. I’ve left mine in fridge for 24 hours. Grill on a Panini type grill or cook in skillet or bake at 350 until you like it. YUM !!! Freezing the tofu makes it more porous when thawed a more water comes out allowing more flavors to be absorbed. You can cut the tofu any size and use any flavoring. The texture is firm as a result of freezing. I eat it alone or in soup. Tofu crumble with Liquid Smoke and Turmeric and Salt and Pepper tastes very much like scrambled eggs. If you are avoiding gluten, try shredded jackfruit! If you’re not avoiding gluten, try your hand at homemade seitan that you shred after baking/steaming. Since cutting out dairy (and living in a very Latin neighborhood) I’ve been staring down my favorite traditional arepas de queso with longing!! If I were to try stuffing these with some vegan moz for that classic flavor how would I go about it?